On October 21, 1921, a group of interested young women assembled at the home of Mrs. W.W. MacGregor to organize a Laredo chapter of the Daughters of the American Revolution. Their charter is dated March 25, 1922. The chapter was named in honor of a great woman, Lucy Meriwether, who was an ancestor of five of the founding members. Among the honors received over the years by Lucy Meriwether Chapter are two of special note. Mrs. Henrietta G. Hamilton was elected State Historian in 1930. Mrs. Robert R. Henry won first place in the nation with her chapter scrapbook in 1932. For this achievement, she was presented with a gold medal by the State Regent, Mrs. W.F. McFadden. Several other accomplishments during those early days are worthy of mention. In 1929, Miss Julia Bell Deutz was instrumental in placing a DAR monument in Jarvis Plaza in downtown Laredo, to honor the Laredo patriots who were killed in WWI. The chapter places a wreath at the monument every Veterans’ Day in memory of all Laredoans who have died fighting for our country. 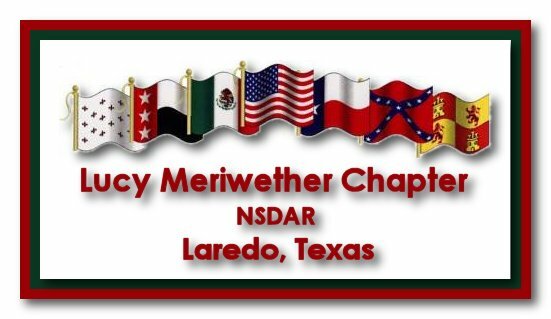 In 1936, Joyce Hopson of Laredo, submitted by Lucy Meriwether Chapter, won the National DAR Good Citizen Award. In 1967, Lucy Meriwether Chapter submitted both the first and second place Good Citizen Award winners in Texas—Jeanne Campbell and Maria del Carmen Saenz. This was the first time the first and second place winners in Texas were selected from the same chapter. If you are eligible for DAR membership and are interested in our chapter, we'd love to hear from you.